These days, you needn’t look to far flung rural fields or hundred-acre farms to find food growing. Chances are, there’s food growing right in your neighborhood. Community gardens have been popping up more and more as the rise of urban agriculture piques the interest of professional and novice growers alike. How Do Community Gardens Work? Community gardens have been around forever, but gained mainstream popularity in recent years as people become more concerned about food security and food quality. Today’s consumers want to know where their food comes from and how it grows. And those living in food deserts (further than 10 miles from a supermarket) often turn to community gardening as a way to gather their own fresh food in the absence of nearby affordable and healthy grocery stores. It takes a lot of work, but anyone can start a community garden, provided they have a chunk of land, permission to grow food on it, and a few helping hands. Organization differs from project to project, but often garden managers will organize teams of helpers and volunteers to plant, harvest, and water on a set schedule so the gardens stay well-maintained. Once the community garden is established, growers can choose if they want to expand into an operation that sells at local markets, distribute the harvest amongst those who contributed to it or donate it to a local cause. There are many different models for success, it all depends on the goals of those involved and which benefits of community gardening growers choose to focus on. Speaking of benefits, there are many. And whether you have a green thumb or not, the positive effect of community gardens can impact you. For starters, local urban agricultural efforts are good for your neighborhood. A study by Ioan Voicu and Vicki Been through New York University’s Furman Center found that community gardens have a positive impact on neighboring property values, especially in low-income neighborhoods. When comparing home values, future buyers may recognize the increased intangible value of a home that’s near a community garden and choose to buy accordingly. Millennial home buyers, especially, are likely to value the presence of local urban agriculture. It may not directly boost housing prices, but it may help attract potential buyers. Since “going green” is one of the best home improvements an owner can make, community gardens can set one home or neighborhood apart from the rest. Any good list of home staging tips includes working on outdoor spaces and making them shine, so homeowners looking to sell can benefit from this research about community gardens, too. Picture this: You’re a prospective homebuyer who’s attending an open house. You’ve seen five properties already, and things are beginning to blend together. What makes one home stand out from the rest? The presence of green space overflowing with food catches your eye. You likely won’t forget a neighborhood or property with good curb appeal in a sea of listings and endless open houses. Sometimes, community gardens turn into something bigger and positively affect not just a few neighborhood folks, but a greater population of people. Take the San Diego School District, for example. Students at Rosa Parks Elementary School enjoy a community garden right at their school that they can eat and learn from. They even created a school farmer’s market and often send extra produce home with students and their families, many of whom live below the poverty line and wouldn’t otherwise have access to fresh, healthy food. Students learn healthy habits, gardening skills, contribute to the food security of their community, and build connections with each other. Whether you want to pursue a wide reach with your garden or simply try to grow food for yourself and your neighbors, these organizations offer inspiration and illustrate the power of a group of people united in growing food for health and happiness. Permaculture is the concept of working with systems that already exist in nature. These systems are both sustainable and self-sufficient. Permaculture doesn’t just apply to farming and gardening, it applies to culture and connections, too. Community gardens that apply the principles of permaculture have the added benefit of creating lasting personal connections between the people involved. There’s nothing that brings people together quite like spending hours weeding a garden, or sharing a meal cooked entirely from the produce grown in a community effort. In addition to personal connections made, community members involved in local gardening often see an increase in health because they’re eating more vegetables and developing healthier eating habits. 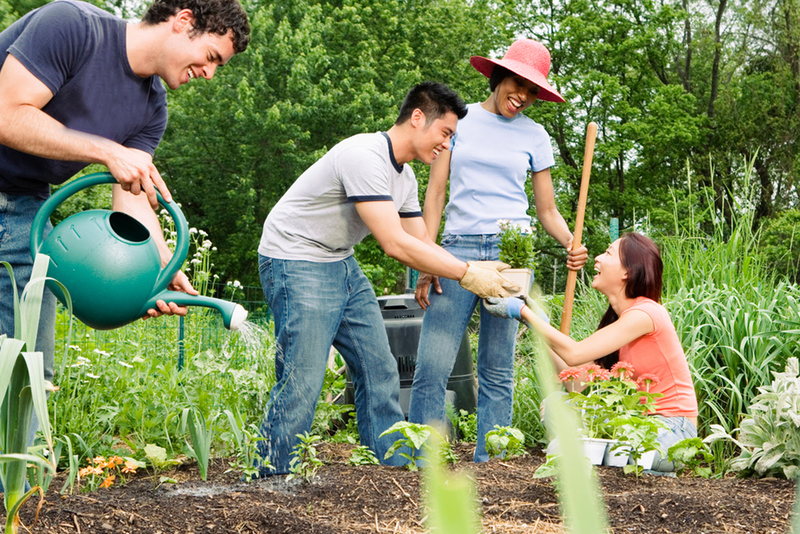 If you’re considering starting a community garden, there are a few things to keep in mind. Just like any home or neighborhood improvement project, it’s good to be realistic about your abilities and know when you can do it yourself and when you might need some professional help to get going. Make sure you know your goals before you begin, and identify different ways people can contribute, from physical labor to funding the start-up costs. Whatever your model is, remember this: Communities who work together to meet a common goal are often happier and healthier. Consider investing in a community garden to reap these benefits and a harvest!